Do you love those expensive, name brand yogurts with special flavors like Mango and Key Lime Pie? You can make specialty yogurts for pennies at home. If you have ever found yourself with milk that is starting to turn, you know how tired you get of trying to salvage it by making baked goods before it gets completely unusable. On the A Year of Crock Potting blog, you will find a recipe for making homemade yogurt in your crockpot, which is not only economical, but is also a great way to salvage that milk before it spoils. This recipe really works, but even by using the suggested packet of gelatin, the homemade yogurt is somewhat thin, and the taste is closer to sour cream than actual yogurt. Still, you are getting a half gallon of homemade yogurt for pennies compared to store prices, so it's well worth the effort and time involved, especially if you are salvaging milk that is turning. To turn this yogurt into something scrumptious and healthy is very simple. All you need is a box of sugar free gelatin dessert mix in the flavor of your choice, and if you like gelatin desserts, you'll know there are dozens of flavors to experiment with. This method is for after the yogurt has cooled in the refrigerator, but doing this just as you have finished making the yogurt would probably be better if you have enough containers to hold it all. Dissolve one package of sugar-free gelatin into 1/2 cup of boiling water and set aside. Let it cool to than 110 degrees or less. Remember, gelatin is packed with protein. On the stove top, heat 2 cups of the refrigerated homemade yogurt on low to 110 F, the optimal temperature for activating yogurt cultures. If you are using the just-made yogurt, you will not need to heat it. Add the gelatin to the 2 cups of homemade yogurt and whisk until well blended. 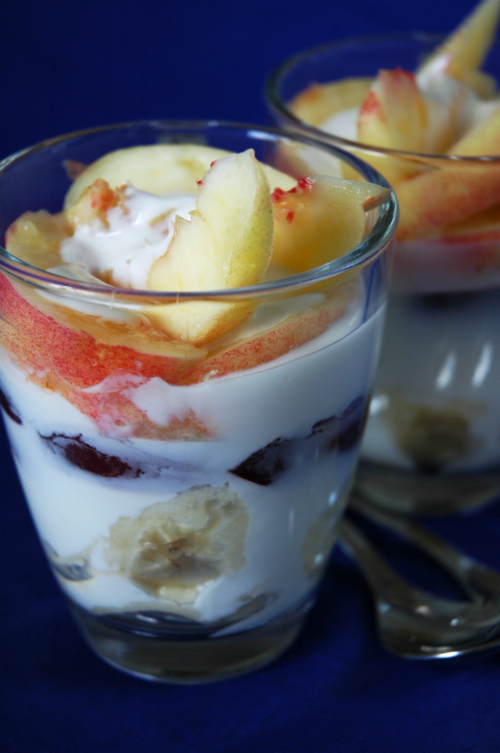 Pour or scoop into dessert cups or small containers and place in the refrigerator. They are set and ready to eat in approximately 45 minutes. These have the consistency of the thick and creamy Yoplait yogurts. If you want to add fruit before it sets, wait until it is soft-set and mix in whatever fruit you desire, then chill until fully set. You can also spoon this into popsicle molds for economical and healthy yogurt pops. This method may work with store bought plain yogurt as well, but won't save you nearly as much money, or keep the preservatives out of your food. If you love yogurt, but are on a tight budget, this is a way to get those specialty yogurts, without all the additives, at a price you can afford. By eating from reusable containers, you are saving landfill space, and by using a crockpot, you are saving electricity, not to mention salvaging that milk that is spoiling. Isn't it nice to reduce your carbon footprint, and get something really good out of it for yourself? Flavored yogurt from bad milk sounds wonderful. Will definitely try to prepare it for sure. Thanks for the share. Liked reading it.